Outdoor Fireplace Dallas: Need Help Designing An Outdoor Fireplace? Check Out These Tips! Need Help Designing An Outdoor Fireplace? Check Out These Tips! Over the last decade, outdoor fireplaces have become a popular trend in outdoor living design. Adding a fire element into your outdoor living space provides an elegant focal point that visually transforms a patio into an outdoor living room, creating a warm, comforting, and relaxing atmosphere. Whether your idea of the perfect night is roasting marshmallows with the kids or snuggling fireside with your significant other, an outdoor fire feature is sure to bring your entire patio space together. If you want to heat things up and install an outdoor fireplace for your home in Dallas Fort-Worth, contact Compass Outdoor Design. Our team of expert patio designers can help you design and construct an eye-appealing outdoor fireplace that will create an unbeatable ambiance and enjoyment. To begin planning your project, click here. Until then, we put together some helpful tips to help you while you are considering the design of your outdoor fireplace. The location of your patio fireplace is essential as it will impact its usage and the overall atmosphere of your patio. Many homeowners choose to place their outdoor fireplace alongside a wall or in a corner. Don’t forget to consider wind direction when choosing the placement for your outdoor fireplace. It should always be cutting the wind and not in its direction, as this could potentially cause hazardous situations. Also, make sure to allow for enough space for furniture to sit along the fireplace — but not too close! Once you have decided the placement and structure, you can then decide the appropriate length of the chimney for your fireplace. Typically, you will be able to select the material for your fireplace that best fits with the style of your home. Common choices of veneer include brick, stone, concrete, or stucco. Brick offers a timeless appeal and extreme durability. If you desire more earthy tones, then stone is the way to go. Concrete can be used to mimic any natural material and get creative with decorative styling for an outdoor fireplace. You can use either colored or textured material. Stucco is relatively inexpensive and simplest to install. The materials you choose for the construction and finish of your outdoor fireplace should depend on your preferred aesthetic and the style of your home. Remember, your hardscape should always compliment your home and should never detract from it! You can choose between either gas-fueled or wood-burning fireplaces. Typically, homeowners prefer to have wood-burning fireplaces as they add traditional authenticity and a rustic sense of style to your outdoor room or sitting area. There’s nothing quite like the crackling sounds of burning timber and unmistakable fireplace aroma that cannot be replicated by a gas fireplace. Gas fireplaces do not require a chimney and are easier to start and clean. However, they do require a vent pipe and a gas line. The gas line has to be trenched and piped from the fireplace to a connection point at the house. Whether you choose a gas or wood-burning outdoor fireplace, you may want to consider adding an area near the fireplace to store wood or propane. A storage area will make it easier and more convenient to keep your fire fueled throughout the evening. If you plan to use your fireplace to cook, plan a storage area for your cooking utensils and accessories, too. Fireplaces already create an ambient light, however, additional light elements can make your outdoor fireplace and the area around it even more appealing. Light fixtures can be incorporated right into the structure of an outdoor fireplace. Consider using light fixtures to highlight special features such as the mantel or storage area. Well lighting, bullet lighting, and downlighting all can be strategically utilized to make your outdoor fireplace even more of a focal point. Considering the following areas will make planning and designing your outdoor fireplace much easier for you. Of course, the easiest way to design an outdoor fireplace is to work with a professional patio design company. 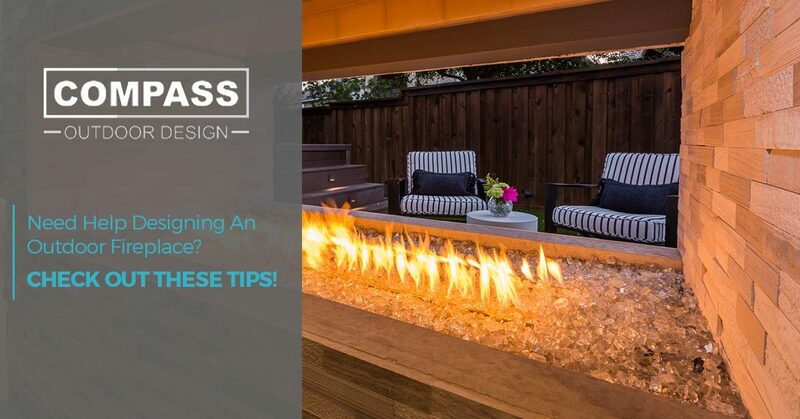 As one of the best outdoor fireplace builders in Dallas, Compass Outdoor Design can help you design and construct the patio of your dreams. To learn more information or to begin planning your outdoor living project, contact us!